Enjoy an out-and-back relatively flat course (fewer than 500 feet of climbing and descending). You'll admire the beauty of the surrounding desert as you follow this paved run from Furnace Creek Ranch along Hwy. 190 through the heart of Death Valley National Park. The entire course is below sea level with fantastic vistas of the surrounding mountain ranges: the Panamints, the Funerals, the Cottonwoods, the Blacks and the Grapevines. Your immediate surroundings are the exotic flora and fauna found only on the desert floor. This is probably one of the most unique courses you could pick for your next race. The desert is beautiful this time of year with mild temperatures; lows range between 30 and 40 degrees and highs hit the low 70s. Consider this the most unique way to qualify for the Boston Marathon. The course is USATF certified (Certification code: CA13003DCR). You can view the USATF Course Certification online here (search for "Death Valley"). 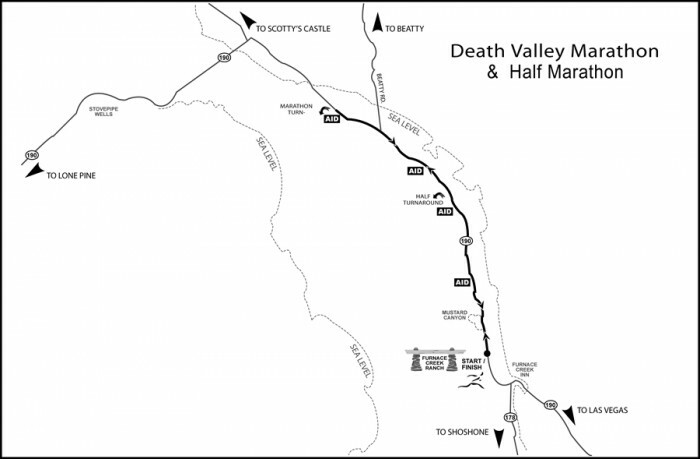 The Death Valley Marathon™ and the Death Valley Half Marathon™ are trademarks of Enviro-Sports. This event is limited 350 total participants and will sell out, so don't wait too long to register! All courses are out-and-back along Hwy 190 through the heart of Death Valley. All races start and finish at the Furnace Creek Ranch. The Half Marathon turnaround is at 6.5 miles and the Marathon turns around at 13.1 miles. The entire course is below sea level, completely surrounded by desert wilderness and boasts panoramic vistas of the mountains surrounding Death Valley. Although the road is not closed to traffic, we ask that you discourage your family and friends from driving along the route. This has caused problems in the past and may jeopardize the future of this event. COURSE CUT-OFF TIME: 6 HOURS (13:45min/mile pace for marathoners, 27:30min/mile pace for half marathoners). Walkers are welcome to participate. CERTIFICATION Marathoners: The course is certified as a USATF-Certified Boston Qualifier. For information on qualifying times for your age group, visit www.bostonmarathon.org/BostonMarathon/Qualifying.asp. READ RACE DAY DETAILS ONLINE HERE. COURSE MARKINGS: The course will be marked with mile marks on the ground. AID STATIONS: There are aid stations & porta-potties located approximately every 3 miles. Aid stations will be stocked with water, Gatorade, sports bars, bananas and a variesty fo sweet & salty snacks. We highly recommend that you carry water. There will also be food/drink at the finish area for all finishers. INCENTIVES: T-Shirts for all participants. Rubber chicken to the first place overall male & female in each distance. Finisher medals to the Marathon and Half Marathon finishers. Personalized award plaques to the first place finishers, male and female, in each age group for the marathon and half marathon, as well as the first place overall male and female finishers of the 10K. Personalized award ribbons to the top three finishers, male and female, in each age group for all distances. BIB NUMBERS: You will pick up bib numbers on race day morning during Athlete Check-in at the Corkscrew Saloon in Furnace Creek. An email with all the race day details will be sent to all registered participants 1-2 weeks prior to event day. All race day details and updates are also posted below in the "Race Day Details" section. PARKING: is available at the Corkscrew Saloon area near the race start/finish. Google Maps Link to start/finish and parking areas. CANCELLATIONS: Registrations are non-refundable and non-transferable. If you email us by January 3, you may receive a rollover credit (the amount you paid minus a $20 fee) to use toward any future Enviro-Sports race. HEADPHONES POLICY: Headphones/earbuds and audible music are NOT allowed as the road you are running on is NOT closed to car traffic. If you are wearing headphones or listening to audible music, you will be disqualified. The National Park Service has asked that we pass along their Principles for participation. Please review them online here. This event is sanctioned by USA Track & Field. 6:45–7:45am: ATHLETE CHECK-IN You will pick up your bib # at the CORKSCREW SALOON at Furnace Creek Ranch. To receive your bib number and participate in this event YOU MUST BRING $10 National Park admission fee or proof of payment (i.e. a receipt from the Visitor's Center or a National Parks annual pass). If you have carpooled to Death Valley, it's best if you pay your fee at the visitor's center as you can both use the same receipt as proof of payment. Otherwise you will EACH have to pay the $10 park fee when you come to get your bib. 7:50am: PRE-RACE ANNOUNCEMENTS will be held at the start line. 8:00am: RACE STARTS at approximately this time. 5:00pm: Informal AWARDS CEREMONY We will announce the overall and age-group winners at the Corkscrew Saloon. It also gives you a chance to swap stories with other runners about the race. Personalized award plaques and ribbons will be mailed out 6-8 weeks after the race. To secure permits for this event, we must strictly abide by the following regulations prescribed by CalTrans, the California Highway Patrol and the National Park Service. The course will be monitored. Violation of any of the following rules WILL result in disqualification. Participants must run on the west shoulder of the highway at all times (both out and back). Crossing the road or running down the centerline to cut tangents is NOT permitted. NO personal support allowed on the course. Participants must carry their own aid and/or use the provided aid stations along the course. Runners must not bunch up in groups blocking the roadway. Runners must run in single file when traffic is in roadway. Runners not yielding to traffic and creating a hazardous situation may be removed from the event and/or issued a citation. Failure to comply with these rules could jeopardize the future of the event. Runners must always have official bib number visible on your front. IMPORTANT! If you are arriving late Friday night, please note that the restaurants stop serving by 9pm and the General Store closes at 9pm as well. The store will open at6:00am on race day morning. The Ranch 49er Cafe at the Furnace Creek Ranch will open early and be offering a runners special light breakfast for purchase from 6:00-7:30AM Saturday morning only. Full breakfast will be available after 7:00AM. (Wrangler Buffet opens at 6am and Forty-Niner Café opens at 7am) Be sure to bring the appropriate food and drinks for your pre-race needs and plan accordingly. FURNACE CREEK INN has a fine-dining restaurant that is open to the public. *Friday night menu to include a special pasta dish for runners*. Advance reservations are recommended (760-786-2331) and a "casual elegance" dress code is required. FURNACE CREEK RANCH offers more informal dining at its two restaurants: The Wrangler Steakhouse and the Forty-Niner Cafe. The Ranch also has a GENERAL STORE with a very limited variety of food and drinks. From Las Vegas (2.5 hours): Take I-15 South and turn West on Hwy. 160 to Pahrump. (DO NOT turn left towards Shoshone at Hwy 372.) Continue on Hwy. 160 approx. 3 miles to Belle Vista Rd. Follow signs to Death Valley. From the San Francisco Bay Area (9 hours): Take I-5 South to Bakersfield. Exit Hwy. 58 East to Mojave. Take Hwy. 14 North to Hwy 395. Take 395 North to Olancha. Take 190 East into Death Valley. From L.A. (5-6 hours): Take Hwy. 14 through Palmdale, Lancaster and Mojave. Take Hwy 14 North to Hwy. 395. Take 395 North to Olancha. Take 190 East into Death Valley. From San Diego: Take I-15 East to Baker. Turn North on Hwy. 127 to Death Valley Junction. Take Hwy 190 into Death Valley. Discount room rates are available at the Furnace Creek Ranch & Inn from Thurs 2/1/18 through Sun 2/4/18. Proceeds from this race benefit the Death Valley Natural History Association and the Beatty High School Students. The young volunteers from the High School and their accompanying parents will be along the course to support you. Be sure to thank them for their hard work! The Death Valley Natural History Association needs your support. Their vision is to inspire passion for the Death Valley and Ash Meadows. Their mission is to preserve and interpret the natural and cultural resources of the Death Valley region. Join other Death Valley enthusiasts who are committed to preserving the World's HOTTEST, DRIEST, AND LOWEST National Park. When you BECOME A MEMBER, you directly help education and research programs in Death Valley and you also have the opportunity to receive discounts at all US National Parks. They also accept DONATIONS. We are proud to partner with them to preserve, protect, and educate people about the wonder of Death Valley. Winter temperatures are typically moderate (between 40 and 70 degrees), but the desert can be unpredictable, so come prepared for rainy, windy or colder conditions. No matter what the temperature, one thing remains constant: Death Valley is dry! Take care to stay hydrated before, during and after your race. Death Valley is one of our national treasures. It takes at least two days to truly begin to explore its splendors, so plan to stay after your race! Visit the Death Valley National Park website to start planning your trip.